Sometimes writers are confronted with unique opportunities to write; that is of course if one dwells, as I do, among lit-nerds and poetry-geeks. One of the best places of which I’m presently aware, exploring the intersection of faith and the arts, is Transpositions UK. It is based at St. Andrew’s University in Scotland. For those like me, who seek a deeper understanding of this crossroads, it simply does intriguing work. My first published book review for this organization may be found here. In it I spend time interacting with the wrestling of others who do so with Flannery O’Connor’s enigmatic and richly metaphoric novel, “The Violent Bear It Away.” If you’ve never had the dark pleasure of reading O’Connor’s novel, do it as soon as possible. 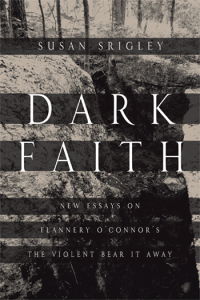 Then, pursue “Dark Faith: New Essays on Flannery O’Connor’s The Violent Bear It Away” as a resource for a broader, more tactile understanding of it’s dark depths. And you thought you wouldn’t have homework. Ha! At such moments of personal celebration I might otherwise have been enjoying a Scotch and a good cigar. But, alas, as a teetotaler now for over twelve years, I shall head to the kitchen for my third cup of coffee and some Cheerios instead.